Brussels, 8 March 2018 – The first prize of the eigths John Houston EPACA ESSAY CONTEST 2018 was handed over by Jean Claude Lahaut, member of the EPACA Professional Practices Panel to François Barry from Cambre Associates during EPACA’s Annual General Meeting, 8 March 2018. The jury is composed of the members of the EPACA Professional Practice Panel: Lisette Tiddens-Engwirda, Jean Claude Lahaut. The John Houston EPACA 2018 Essay Contest, with the topic “The Impact of digitalization on Public Affairs”, aimed to highlight the Public Affairs profession and bring recognition to young practitioners. Young talents under the age of 30 and working for consultancies member of EPACA were invited to take part in shaping our profession by sharing their views and experiences in an essay competition. The Jury was the members of our Professional Practices Panel. Vojtech Nemec from Kreab was unanimously designated by our Jury as the winner. His essay showed both talent and originality! 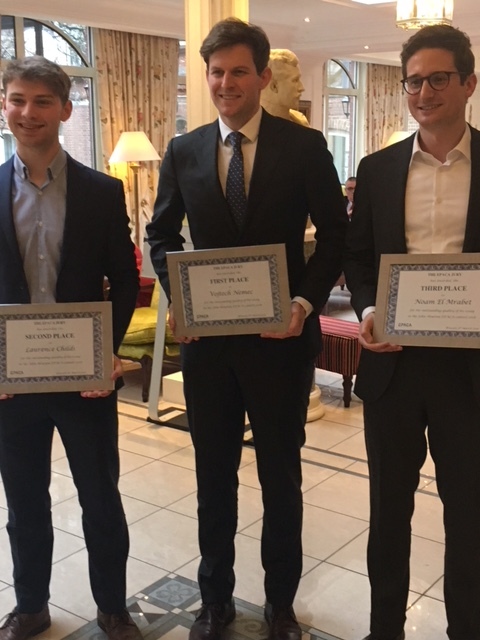 Runners up in the contest were Laurence Childs from FleishmanHillard ranking second, and Noam El Mrabet from Interel ranking third. We congratulate them for the excellent quality of their essays. Is the future of Public Affairs online? Tweet by tweet, today’s lobbyists get engaged in online debates. Your boss, the MEP you need to speak to, including the assistants – everyone posts an array of less or more insightful contributions to any policy topic available. During important announcements, elections or press conferences, discussion becomes a vivid race for attention and endorsements coming to those with the wittiest tweet. You see consultants sharing position papers on a profile of a Commissioner or those drafting a dossier of interest. Our industry is under growing pressure to adapt to this new reality. Consultants are encouraged to be increasingly present on social networks. Our messages become shorter, snappier and well-packaged for the virtual audience. Our events carry hash-tags and reach listeners far beyond the Brussels bubble. It may seem that our work will revolve around a blue screen with the occasional trip to the coffee machine. Nevertheless, those who laid the foundations to the way EU public affairs is done today, clearly didn’t possess a smart phone with Twitter account. Most importantly, their trade meant meeting people and building long-lasting personal relationships, sometimes real friendships. They spent days and months lobbying the decision-makers as well as their clients in pursuit of a constructive partnership benefitting both. In fact, if you are lucky enough to have them walk around your open space today, talk to them. Once they start giving you a master class in lobbying, heads turn and phones slide back into their pockets. Their message to me was – go out there, network and simply be nice to people. The power of personal connections with decision-makers merged with the way we communicate complex messages, is what ultimately brings real added value to our clients. Even the digital age will not be able to change that law of nature. To my mind, public affairs has always been about audience. About speaking, not just to the most people but the right people; engaging them with content and issues relevant to them. As society ‘goes digital’, the Public Affairs community must first and foremost keep pace with its audiences. Digital tools allow for accuracy in targeting like never before. Incorporating online data analysis enables identification of and contact with key groups. Feedback on ‘who clicked what’ or ‘which posts were popular’ can be gathered easily and concisely. However, the main impacts go beyond just the software benefits. A key component of digital is the interactive side. The firm-audience relationship now flows far more fluidly, in both directions. It offers new opportunities to connect personally with the public. The price paid for these advantages is the accompanying scrutiny Public Affairs output will increasingly receive. Audiences now expect personalisation, businesses are expected to keep up with the fast-flowing news cycle as live participants in the conversation. ‘Fake news’ placing as 2017’s word of the year illustrates the burgeoning scepticism towards the media, on or offline. PA has to work further towards open engagement with their digital audiences, establishing an image of transparency and credibility, insuring against critique. Public Affairs must adapt their techniques to this digital audience. With any content now competing against the entirety of the internet, the focus becomes engagement. Without a captive audience, the new priority is capturing viewers’ attention. For this reason, eye-catching visuals are on the rise, with estimates that 82% of digital traffic will be video by 2020. Public Affairs needs to tell stories quickly, simply and persuasively or lose the limelight… But these skills should not seem unfamiliar, only the platforms and packaging. As always, efficient, emotive, engaging storytelling remains a lasting mainstay of Public Affairs. How long before you are replaced by an algorithmic lobbyist? In his 2015 book, Humans Need Not Apply, Jerry Kaplan of Stanford University wrote: “Automation is blind to the colour of your collar.” Despite Kaplan’s warning, many keep believing that their job is safe. This is certainly true in Brussels, where most public affairs consultants have been left unscathed by automation so far. But this is about to change. Last month in Davos, Tim Hwang, the 25-year-old CEO of US tech firm FiscalNote, announced the acquisition of Brussels-based Shungham, marking the first time ever a Silicon Valley start-up takes over an EU public affairs consultancy, and showing just how Moore’s law has reached a new peak. FiscalNote – much like its competitor Quorum, which is also gaining ground in the EU quarter – uses algorithms to automate some of the most repetitive and labour-intensive parts of the work of public affairs professionals. Within a few clicks, its software gathers data from the Internet and extracts information to monitor policy issues and map decision-makers. It also allows automated machine-customised emails and can determine the chances for an amendment to be adopted. These “digital disruptors” were successful in recent lobbying campaigns in the US and are just getting started. But does this mean that lobbyists are on the verge of going extinct? Not really. While most companies should jump on the bandwagon of digitalisation to aim for resource efficiency, and while more digital savviness will be requested from public affairs professionals – especially younger ones –, the situation in the Bubble remains very different than on K Street. Indeed, in recent years in Brussels we have seen the generalisation of the notoriously secretive trilogues and the growing importance of complex procedures such as comitology. Secret and offline EU law-making has taken over, making the human insight and oversight more necessary than ever.